Abanoub was born in a town called Nehisa in the Nile Delta. He was the only son of good Christian parents who died when he was a young child. 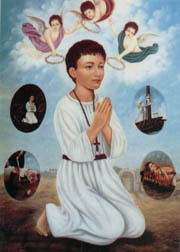 At age twelve Abanoub entered the church to hear the priest asking the congregation to remain faithful during the persecutions provoked by Diocletian, the Roman emperor. Abanoub received the Holy Sacraments, then he prayed God to guide him to where he can confess his faith in the Lord. After that Abanoub went out, and gave all his possessions to the needy. Then he set off to a city called Samanoud, on foot. While he was walking, he saw the Archangel Michael in celestial glory. The sight was so extraordinary that Abanoub fell to the ground, but the Archangel raised him up, and told him that he must suffer for three days in Samanoud and he would also witness to Jesus Christ in other places. Once in Samanoud, Abanoub went to the Roman ruler and declared his faith openly. He also insulted the ruler's idols. The ruler became furious, and gave orders that the child be whipped on his belly. The soldiers beat Abanoub severely until his intestines poured out of his tummy. But the Archangel Michael miraculously healed him. Then the ruler put him in jail with other Christians who were encouraged by his presence among them, and later were martyred for the name of the Lord. The following day, the ruler took Abanoub on a boat to a city called Atrib, and as a form of punishment, the young saint was hanged upside down from the sail of the boat. The soldiers along with their ruler started drinking and dancing and hitting Abanoub on the mouth. Abanoub's nose bled, but then unexpectedly, the soldiers became blind and the ruler became paralyzed. In their agony they cried to him and said, "Please Abanoub, pray to your God to heal us. For if we are cured, we will become Christians." St. Abanoub replied, "This will only happen in Atrib, so that everyone there should know that there's no other God but Christ." When they arrived in Atrib, they were all healed, and they cried with joy, "We are Christians! We believe in the God of Abanoub!" Then they took off their uniforms and threw them on the ground in front of the ruler of Atrib. The governor got very mad, and ordered that they all be killed.